For example: If Vin = 2.2Vpp @ 1.2kHz the output of a voltage follower would be, Vout = 2.2V @ 1.2kHz in phase. For example: If Vin = 1Vpp @1kHz and RF=60k ohms and R1=30k ohms then the gain is 3 V/V so therefore, the output, Vout = Vin x Gain = 3Vpp in phase. For example: If Vin = 0.8Vpp @ 700kHz and RF=60k ohms and R1=30k ohms then the gain is -2V/V so therefore, the output, Vout = Vin x Gain = 1.6Vpp out of phase. For example: If Vin(Va) = 2Vpp with a 1Vdc offset @ 300kHz, Ra=R1=10k ohms, RF=Rx=15k ohms, and Va=1Vdc then then the output, Vout = (Vin – Va) x Gain = 3Vpp. For example: if Va=1Vdc, Vb=2Vdc, Vc=3Vdc, Ra=Rb=Rc=100k ohms, RF=24k ohms, RB=12k ohms then Vout = (1+2)((1+2+3)/3)=3*(6/3)=6Vdc. 1. 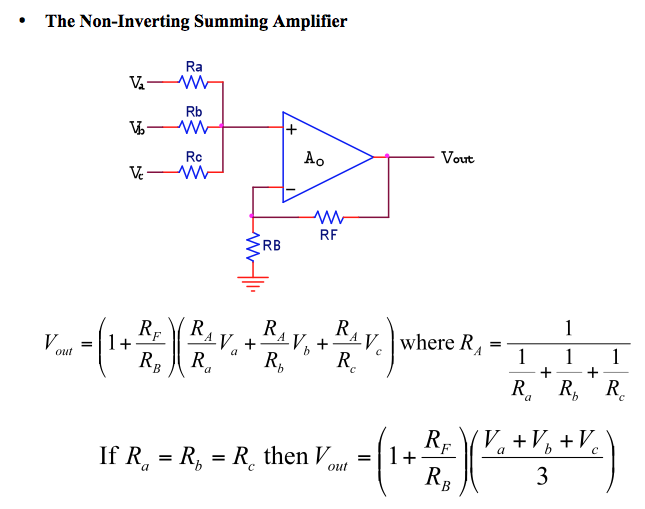 True or False, given the same RF and R1 values, the gain of a non-inverting amplifier is always larger than the absolute value of the gain of the inverting amplifier. 2. 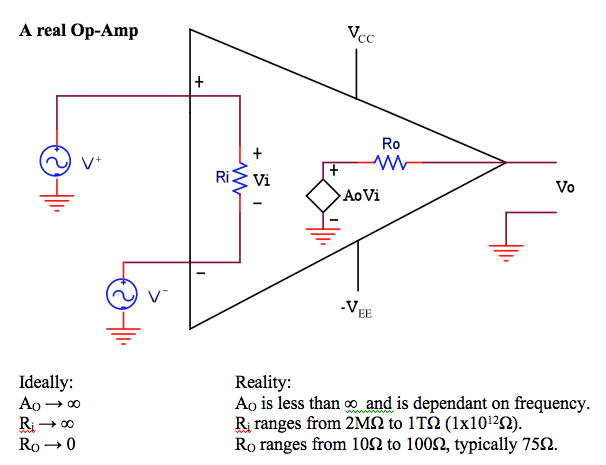 If R1=RF, what is the gain of a non-inverting amplifier? 3. If R1=24k ohms and RF=8k ohms what is the output voltage amplitude if the input voltage amplitude is 1.5Vpp when an inverting amplifier is used? 4. A differential amplifier is used in a situation where the input voltage (Va) is 0.8Vpp with a .2Vdc offset. The output voltage has no DC offset, it is just a 1.6Vpp wave. What is the DC voltage at input Vb? 5. You are given a circuit and asked to replace the components because the functionality at high frequency has dimished over the past few months, but it still works at DC. You know it is an amplifier, but you cannot make out the color bands on one of the resistors. You find that one resistor is 48k ohms (R1). You also measure the input and output waveforms and they are 0.25Vpp and 2Vpp respectively. Since the input and output are in phase you assume that the amplifier is a non-inverting amplifier. What is the value of the unknown resistor (RF)? 6. Three amplifiers are used in a cascaded arrangement, that is, the output of the first amplifier is the input to the next and the output of the second amplifier is the input to the third. The first op amp is a non-inverting amplifier with RF=100k and R1=25k. The second and third op amps are setup in an inverting configuration, both with RF=50k and R1=20k. If the input to the first op amp is 0.1Vpp what is the output of the third op amp and what is its phase relationship with the input? 7. A non-inverting summing amplifier is used in a circuit with Va=1Vdc, Vb=3Vdc, Vc=5Vdc, Ra=Rb=Rc, RF=28k ohms, and RB=14k ohms. What is the voltage output? I don’t understand how to do #4 without having values for RF or R1. Consider RF/R1 one constant that can be solved for. Additionally, just as in discussion 18 (in the common-emitter amplifier) complete the AC analysis and DC analysis separately. That is, solve the equation Vout=(Va-Vb)(RF/R1) for only the AC component of both the input and output voltages. You will be able to solve for (RF/R1) as one constant with that equation. Then solve the equation for only the DC components using that constant value for RF/R1 you solved for in the last step. Additionally, it is safe to assume that there is no AC component to Vb, it is purely DC. I guessed correctly on the quiz by process of logical elimination, but I still don’t understand. I think I need to see this solving process worked out on paper. Thank you! No problem, stop by anytime or we can go through it during your lab time.